This page contains several videos demonstrating various component replacements for the iPhone 4S. The most common of these replacements is the LCD. The iPhone 4S has been on the market for quite some time allowing the cost of this replacement part to drop significantly. The repair procedure on the other hand is one of the more time consuming ones because the screen cannot be removed until the majority of the phones internal parts have been removed. Keeping the screws organized is especially important since there are so many and few of them are interchangeable. We find the best way to keep these screws organized is to use a Magnetic Project Mat . Project mats printed with schematics specifically for the 4S are also available but before you invest in one you should consider whether or not you will also be working on different versions of the iPhone 4. Since the internal components are arranged differently from one model to the next the printed types are not interchangeable. If your intention is to repair phones on a regular basis then you will most likely end up purchasing a mat for the 4, the 4S, and one for the CDMA version of the four. For this reason we suggest buying the unprinted type which is coated with a dry erase surface making it possible to draw out your own notes and schematics as you go and erase them later if necessary. 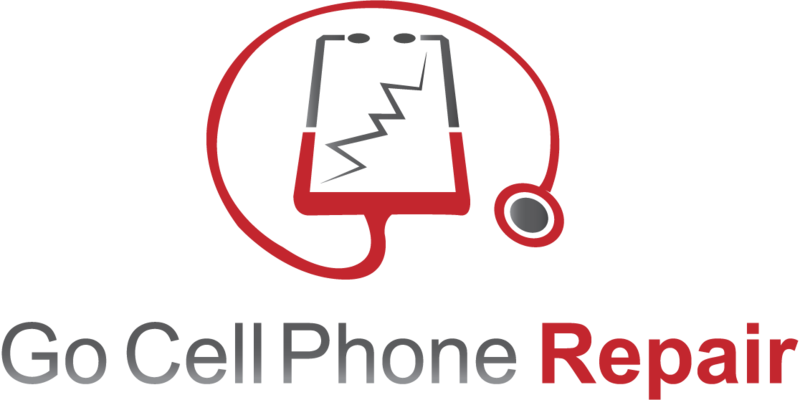 There are a few things that you should watch out for when performing any repair that requires removing the iPhone 4s logic board. There are also important things to be conscience of when it comes to removing the LCD. Once the rear panel of the phone has been removed you will disconnect the battery and remove the EMI shield. It is here that some people get into trouble. 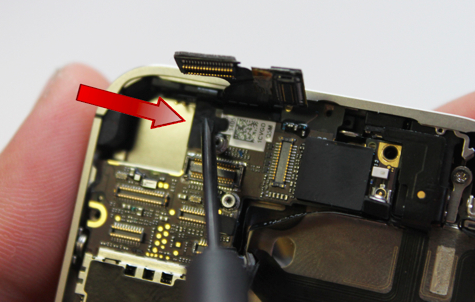 Looking at the phone from the back side you will notice that the upper left hand corner of the logic board has a pop connector which is attached to the main camera. Once this has been disconnected and the camera removed there is a small piece of black tape covering a "hidden screw" that holds the logic board in place. Failure to remove this screw can result in a damaged board if you attempt to remove it with the screw still in place. The image below shows the location of this sticker. Peel this sticker off to reveal the hidden screw. Just above the middle of the red arrow is another sticker which covers one of the four corner screws that hold the LCD frame in place. Forgetting to remove this screw isn't quite as hazardous but can lead to damaging the LCD frame. While this isn't typically a big deal it is a good idea to prevent to much pressure from being applied to the original screen if you plan to recycle it. A functioning iPhone 4S LCD is worth something since it can be fitted with a new digitizer and lens. Many parts suppliers will pay you or at least issue credit toward future purchases if you are able to salvage the LCD without damage. Prying to much with this corner screw still installed can potentially damage the display. Tip: Besides the four corner screws holding the LCD assembly in place there are six more located along the left and right edge of the mid-frame. These screws are easy to identify since they have washers between them and the frame of the phone. It is possible to remove the LCD without completely unscrewing these six from the mid-frame. As long as they have been loosened a bit the washers will allow enough movement so that the frame can be released. At the same time you might find it a little tricky to get the new LCD installed with the metal tabs on the correct side of these washers. The iPhone 4S power button is one of the few moving pieces of hardware built into the device. When it comes to electronic products, moving parts are traditionally known to be the first thing to fail. The iPhone 4 and 4S are no exception to this rule as both are prone to wear and tear when it comes to the power and home buttons. In this video I will demonstrate how to remove your old power button flex cable and replace it with a new one. This is an intermediate level repair. If you choose to do this yourself be very careful as there are many delicate cables and components in the vicinity where you will be working.